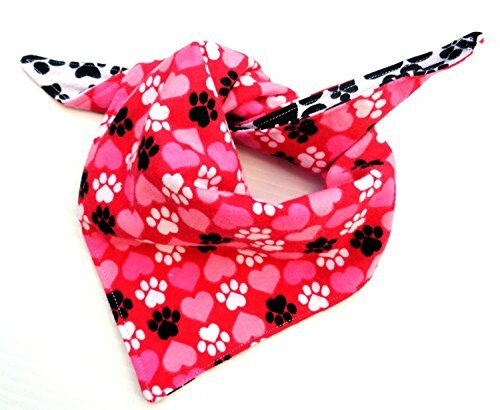 This is reversible 'tie on, tie at the back' type dog bandanna. This is made with flannel fabric with paws and hearts prints on a red background. The other side is black paws and pink hearts and paws on the other side which is perfect for Valentines Day or any other day that calls for love, hearts and paws. Perfect for girl dogs. Size Medium but will also fit small dogs. Measurements are on the photos. Fits Small to Medium size dog. If you have any questions about this product by puranco inc, contact us by completing and submitting the form below. If you are looking for a specif part number, please include it with your message.